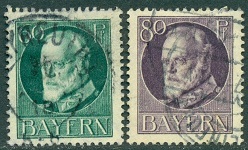 Bavarian stamps underwent another evolution in 1914. Prince Regent Ludwig, the son of former Prince Regent Luitpold, deposed the ailing King Otto I in November 1913 and declared himself King Ludwig III. In March of 1914 a new series of definitive postage stamps was issued, featuring the portrait of King Ludwig III. The Pfennig denominations were all perforated 14 x 14 1/2, and the Mark denominations were all perforated 11 1/2. All the stamps were printed on paper with the horizontal wavy lines close together watermark. The first issues of the Ludwig III definitive stamps are called the Peacetime Printings. This first printing included sixteen stamps, ranging from the 3 Pf. denomination through the 20 Mk. denomination (Mi. #95I-09I, Sc. #95c-14a). All of the Pfennig denominations of the Peacetime Printing are shown in the images above (Mi. 94I-03I, Sc. #95c-08a). On the Peacetime Printings, the colors are bright and the impressions are clear. The Peacetime Printings were produced and used from the end of March 1914 through the end of 1915, though remaining stocks of them were probably used beyond that date. The Scott Classic Catalog suggests collecting these USED, with cancellations dated before the end of December 1915, which is a good idea, as the Mark denominations of the Peacetime Printings, in USED condition, are very expensive. The Ludwig III definitive stamps produced after January 1916 are called the Wartime Printings. These printings included the same denominations produced during the Peacetime Printings. A new 2 Pf., 2 1/2 Pf. surcharge, 7 1/2 Pf. deep green, 10 Pf. carmine, and a 15 Pf. vermilion, were added to the series, between 1916 and 1920. Examples of the Wartime Printings are shown in the images above (Mi. #94IIA // 109IIA, #110A-15A, Sc. #94 // 15, #115). On the Wartime Printings, the colors are dull and the impressions are coarse. The Bavarian stamps of King Ludwig III were also issued imperforate, for collectors, between 1916 and 1920. They are shown in the images above (Mi. #94IIB // 109IIB, #110B-15B, Sc. #117-35) and are all from the Wartime Printings. The four tete-beche pairs from the definitive series are shown above. These came from the booklet pane sheets. The 5 Pf. and 10 Pf. pairs are from the Peacetime Printing. The other two are from the Wartime Printing. Two booklets were produced for this series. The first booklet, produced in 1914, contained two panes of the 10 Pf. and four panes of the 5 Pf. from the Peacetime Printing. The second booklet, produced in 1917, contained two panes of the 15 Pf. and two panes of the 7 1/2 Pf. from the Wartime Printing. An uncut booklet pane of 5 of the 15 Pf., with a St. Andrews Cross label is shown in the image above. 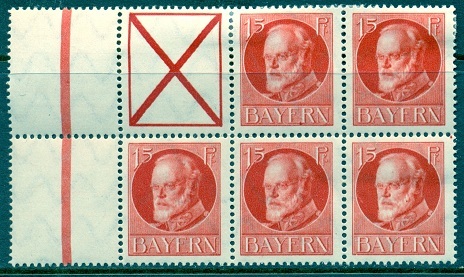 All of the stamps of the King Ludwig III design continued in use through 1919, though the monarchy actually ended in 1918.